The Mullock Episcopal Library (now the Basilica Museum) is home to some of the oldest books in the province. On this day (29 March 1869) the talk in the town was all about the death of the Catholic Bishop of St. John’s, John Thomas Mullock. John Thomas Mullock was born in 1807 at Limerick, Ireland. In July, 1850, he became the Catholic Bishop of Newfoundland. He is celebrated for much that he did for the local church, he completed the splendid Cathedral (now Basilica) of St. John’s, built the Episcopal Library now the home for the Basilica Museum, founded St. Michael’s Orphanage, and established St. Bonaventure’s College. All buildings designated in 2010 as part of the Ecclesiastical District of St. John’s by Parks Canada. He would have likely celebrated the building of The Rooms in the neighborhood of his Basilica Cathedral. He had hoped that the neighborhood around the Basilica would become the academic and cultural centre of the town. He was also keen to make Newfoundland a hub of activity in the emerging communications industry. Long before the first attempts to lay a submarine cable across the Atlantic he was (1857), the first to publicly propose the feasibility of connecting Europe with America by means of submarine telegraph. Recommended Reading: Ecclesiastical History of Newfoundland, volume II / by Archbishop Michael F. Howley, edited by Brother Joseph B. Darcy, associate editor, John F. O’Mara. This entry was posted in Archival Moments and tagged basilica, bishop mullock, Episcopal Library, Limerick, St. John's, The Rooms on March 29, 2019 by Larry Dohey. 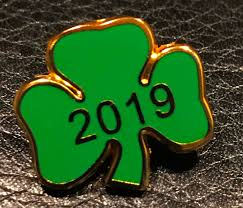 The Newfoundland tradition called “drowning the shamrock” takes place on St. Patrick’s Day, when the shamrock that has been worn in the hat or lapel is removed and put into the last drink of the evening. 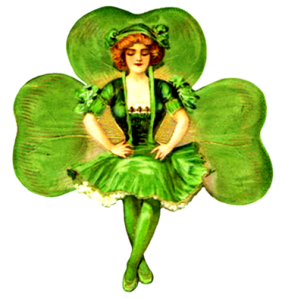 A toast is proposed and then, when the toast has been honored, the shamrock is taken from the bottom of the glass and thrown over the left shoulder. Archival Collection: At the Rooms Provincial Archives take some time to look at MG 612 the Benevolent Irish Society (BIS) collection. This collection consists of the minute books of the BIS (1822-1933, 1938-1970, 1973-1979); agendas (1964-1970); Centenary Volume (1806-1906); loan receipts (1905-1906); journal (1910-1920); cash book (1920-1931); ledger (1939-1944). 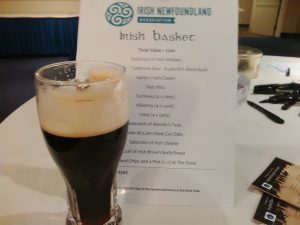 This entry was posted in Archival Moments and tagged Benevolent Irish Society, Drowning the shamrock, Sheelagh's Brush, Sheila's Brush, Sláinte!, St. patrick's Day, Talamh an Éisc on March 14, 2019 by Larry Dohey. The political reporters that now cover the news at the Confederation Building do so only after considerable thought and reflection on the discussions that they hear in the legislature. It was not always so!! Rorke and other members of the House of the Assembly, located in the Colonial Building on Military Road, St. John’s were suggesting that the bias of the reporters and their newspaper editors was the news. At the time St. John’s boasted a number of daily newspapers including, Newfoundland’s first newspaper The Royal Gazette, (1807 – 18?? ), the Morning Chronicle, (1862-1881), The Newfoundlander (1827 -1884), The Ledger (1875 -1882) and The Evening Telegram (1879 – present). Each was trying to carve out their own readership and in the 1880’s they took some very definite Editorial positions. In the 1880’s the two big “editorial” discussions in Newfoundland were about Confederation with Canada and support for a railway. The Morning Chronicle was the principal anti-Confederate newspaper; The Newfoundlander was the principal Confederate newspaper and enthusiastically supported the railway. Journalists drinking and playing cards in the ” Reporters Room” in the Colonial Building. What were these journalistic thinking? Why is there no ‘Reporters Room’ in the Confederation Building ? Recommended Archival Collection: The Rooms Provincial Archives Division holds microfilm copies of over 30 Newfoundland and Labrador newspapers dating from 1810 – 1982. 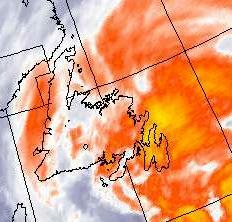 See also The Historical Directory of Newfoundland and Labrador Newspapers 1807 – 1996. This entry was posted in Archival Moments and tagged Colonial Building, Journalist, newspapers on March 11, 2019 by Larry Dohey. This entry was posted in Uncategorized on March 11, 2019 by Larry Dohey. The harbour is quiet, no slides for the children. The first week in March month in St. John’s traditionally saw the population grow by the hundreds as the “men from the bay” began to arrive in the city hoping for a berth on the sealing vessels going out to prosecute fishery. The city, especially the waterfront, would be busy with activity. 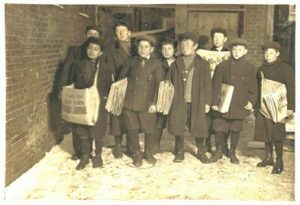 Many of the men would be looking for lodgings as they awaited news of a berth on one of the vessels, some consumed a little too much and there were the inevitable rows between the ‘bay men’ and ‘the townies’ looking for the same work. The Gambo train station was the terminus for just about all of the sealers who would walk the trek from Wesleyville to the train station in Gambo, “an unpleasant tramp” that took from 24 – 32 hours. However, there would be much excitement in Gambo, especially among the children. The children would be waiting for the Gambo slide. 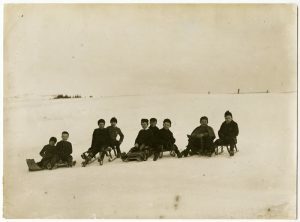 The Gambo slide was a small lightweight sled that was constructed by the men of Wesleyville and area, that they used to pull their sealing gear and clothes. As the men of Wesleyville, now exhausted from walking, approached Gambo, the children of the town would be on the outskirts to help them pull their slide for the last few miles. 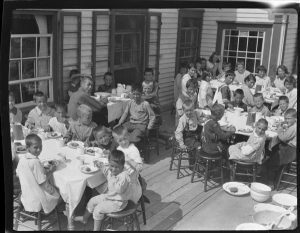 Photo Credit: The Rooms Provincial Archives. Start of the Slide Race. A11-19. Elsie Holloway Studio, St. John’s. The children knew once they pulled the “Gambo slide” to the train station, the sealers would board the train for St. John’s and the slides would be theirs! Walking in the unpredictable weather especially in March month, the slides not only served to lighten the loads of what the fishermen had to carry, if the weather “turned on them”, they could always burn the slides and use the wood as a heat source. One story goes that upon arrival in Gambo a small group of young men from Greenspond, Bonavista Bay had hours to wait for the train. With the loss of markets for seal products, the hustle and bustle that came with the preparations for outfitting the boats and signing on the crews in St. John’s is no more. The first week of March on the St. John’s waterfront is now quiet. Recommended Reading: The Last of the Ice Hunters: An Oral History of the Newfoundland Seal Hunt edited by Shannon Ryan, Flanker Press,St. John’s, NL. Recommended Reading: Perished: The 1914 Newfoundland Sealing Disaster by Jenny Higgins. Boulder Publications, Portugal Cove Conception Bay, NL. This entry was posted in Archival Moments and tagged David Blackwood, Dohey, Gambo slide, March Month, sealing, Wesleyville on March 6, 2019 by Larry Dohey. Ash Wednesday (March 6) is the beginning of Lent. What are these ashes all about? A colleague looked at another colleague and wondered why she had “ashes” on her forehead. (March 6, 2019 TODAY ) in the tradition of most Christian churches (Roman Catholic, Anglican, Lutheran and others) it is Ash Wednesday, originally called dies cinerum or day of ashes. Ash Wednesday is the name given to the first day of the season of Lent, in the typical Ash Wednesday observance, Christians are invited to the altar to receive the ashes. The Pastor applies ashes in the shape of the cross on the forehead of each, while speaking the words, “Repent, and believe in the Gospel” or the dictum “Remember that you are dust, and to dust you shall return.” (Genesis 3:19). For over twelve hundred years on the dies cinerum (day of ashes) faithful followers have approached the altar and received ashes upon their foreheads. These ashes are made from the burnt palm branches that were blessed on the Palm Sunday of the previous year. Abstaimning , fasting and generally changing one’s lifestle during Lent was taken very seriously. People would often give up there favourite food, would refuse to play cards and or attend dances and other social functions. Imagine, no movie for 40 days!! The idea of abstinence and fasting is not exclusive to the Christian world. Buddhism, the Buddha Himself encouraged monks and nuns to limit their food intake after the noon meal, and therefore it is common practice among Buddhist monks and nuns to refrain from eating after noon until the next morning on a daily basis. Jews fast for six days which are spread out at various times in the Jewish calendar year; this means abstinence from food and liquids for both men and women – unless certain exemptions are necessary such as illness or pregnancy. The most important and holiest day of the Jewish year is Yom Kippur (The Day of Atonement), and on this day Jews will fast and pray for a period of 25 hours. Muslims fast between sunrise and sunset for 30 days during the month of Ramadan, (which is the month the Prophet Muhammad revealed the Quran), followers are to abstain from food, liquid and smoking. Fasting is considered the fourth of the Five Pillars of Islam (These pillars are: i. Creed; ii. Daily prayer; iii. Almsgiving; iv. Fasting; v. Pilgrimage), and it is obligatory for both men and women. This entry was posted in Archival Moments and tagged Howley, Lent, movie, moving picture, Paramount on March 5, 2019 by Larry Dohey. Mardi Gras literally means “Fat Tuesday. The day is also known as Shrove Tuesday (from “to shrive,” or hear confessions) or Pancake Tuesday. The custom of making pancakes comes from the need to use up fat, eggs and dairy before the fasting and abstinence of Lent begins. This year Ash Wednesday is on March 6. On Shrove Tuesday, (March 5) Christians were encouraged to confess their sins so that they were forgiven before the season of Lent began. The term survives today in ordinary usage in the expression “short shrift”. To give someone short shrift is to pay very little attention to his excuses or problems. The longer expression is, “to give him short shrift and a long rope,” which formerly meant to hang a criminal with a minimum of delay. Pancakes were a simple way to use these foods, and one that could entertain the family. Objects with symbolic value are cooked in the pancakes, and those who eat them, especially children, take part in discovering what their future will be as part of the meal. a holy medal—the house blessed with a priest or a nun. This entry was posted in Archival Moments and tagged Fat Tuesday. Mardi Gras, Lent, pancake, Shrove Tuesday, tradition on March 4, 2019 by Larry Dohey.